In the third month, the Israelites observed the Feast of Weeks, presumably named because it was held seven weeks and one day after Firstfruits. This span of time equals 50 days, so the feast also came to be known as Pentecost (=“fiftieth”) (Lev. 23:15, 16; Acts 2:1). During this 50 days, more of the harvest ripened. This new grain was waved before the Lord as were the firstfruits but with one important difference: it was baked into two loaves of bread made with yeast (Lev. 23:17). When Acts chapter two begins, we find the first disciples praying together on the Feast of Pentecost. As the fledgling church prayed, the Holy Spirit was poured out. Christ, we have seen, was the firstfruits when He rose from the dead. The first Christians were like the next portion of new grain that ripened during the seven weeks that followed Firstfruits; through the outpouring of the Holy Spirit, they were ushered into Christ’s resurrection and became firstfruits themselves. This is the fulfillment of Weeks or Pentecost. Throughout the scriptures, the Holy Spirit is represented by oil. Oil was poured on prophets, priests, and kings as a sign that the Holy Spirit would empower them for their office (Psalm 105:15; Ex. 29:7; 1 Sam. 10:1). When David was anointed by Samuel, scripture says, “So Samuel took the horn of oil and anointed him in the presence of his brothers, and from that day on the Spirit of the LORD came upon David in power” (1 Sam. 16:13; cf Acts 10:38). On Pentecost, Peter explained the outpouring of the Holy Spirit in this way: “God has raised this Jesus to life, and we are all witnesses of the fact. Exalted to the right hand of God, he has received from the Father the promised Holy Spirit and has poured out what you now see and hear” (Acts 2:32, 33). God anointed Jesus with the fullness of the Holy Spirit, choosing Him to be Christ (=“Anointed One”) (Acts 2:36). Christ’s anointing then flowed down to the first Christians, joining Christ and His people into one body through one Spirit. Psalm 133 helps us visualize what happened on the day of Pentecost: “How good and pleasant it is when brothers live together in unity! 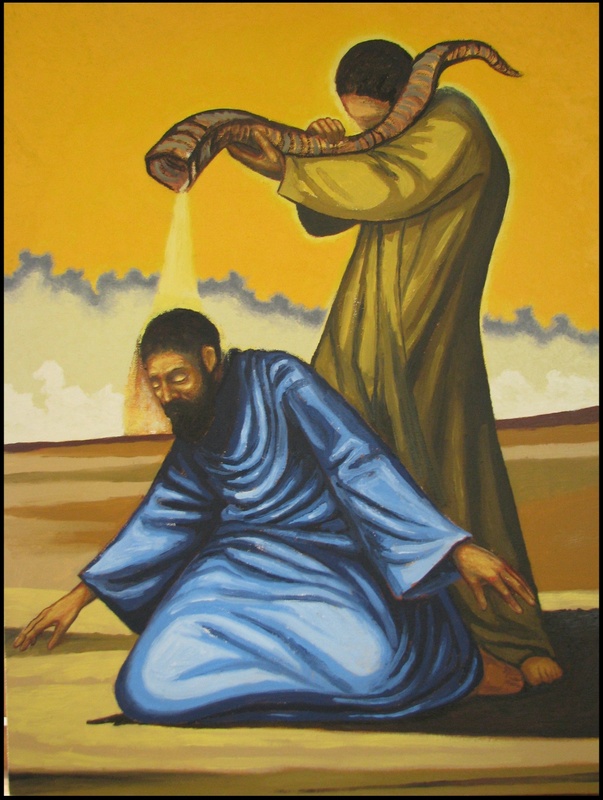 It is like precious oil poured on the head, running down on the beard, running down on Aaron’s beard, down upon the collar of his robes” (Psalm 133:1, 2). The head and body are one through the flowing down of the oil just as Christ (our head) and His body are one in the Holy Spirit. “For we were all baptized byone Spirit into one body—whether Jews or Greeks, slave or free—and we were all given the one Spirit to drink” (1 Cor.12:13). Obviously, this wasn’t bodily resurrection as was Christ’s. But as seen in the previous post, resurrection is first a spiritual reality and will later be a bodily reality. Acts 10:38 says Jesus was anointed during His earthly ministry as well. Death, of course, ends the anointing and office of a person (Heb. 7:23). This was no less true for Christ when He died on the cross. The anointing of Pentecost was a new anointing for the risen Christ who would perform an eternal ministry.